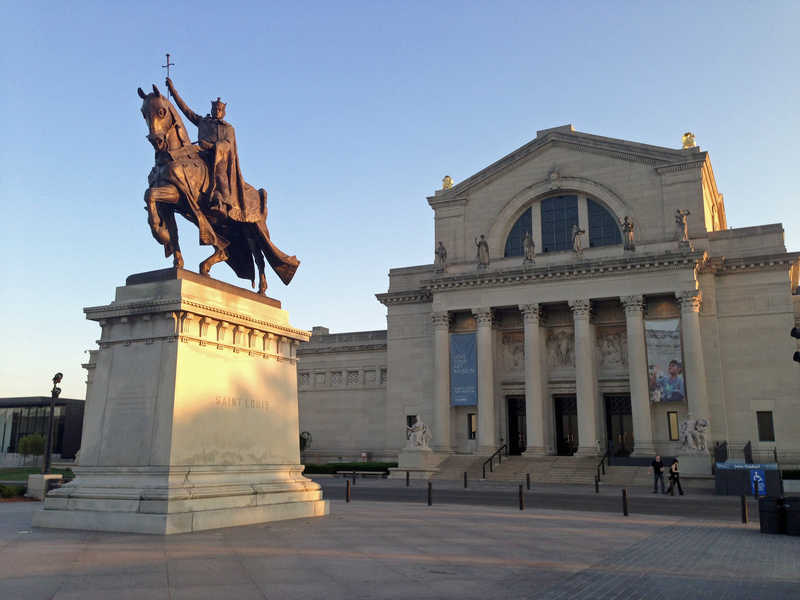 The St. Louis Art Museum recently reached out to me, saying that they wanted to look into doing their blogs differently. “They come off too much as press releases,” they said. When I looked into them, I found them filled with good content and well-written — but yes, they could be more engaging. Press Releases, which I also do a lot of, are top-down pieces. The company/organization is relaying information. Social Media is a conversation. When I blog for businesses, I always adapt their tone (and this is where my play writing experience comes in handy), but write in a way that gets a reaction. This assignment was plumb – they gave me a great topic and provided me with the headline: “Tale of Two Kitties.” The reaction was off the charts, much higher than their typical blog post. Within a week, last I checked, on the FB page it got over 400 likes and over 50 shares and more comments than usual. From the blog, it got over 500 likes. I love ghostwriting blogs for anybody – at the other end of the spectrum, I take care of a St. Louis-based insurance broker, too. Another client of mine is the St. Louis Convention and Visitors Commission. I make sure every blog I write has plenty of links, thus increasing its SEO (my own blogs are no exception!). If I can help with your company or organization’s blog, I’d love to have that conversation – please contact me. While we acknowledge we’re a bit late to the whole “put a cat on Facebook” phenomenon, our ancient Egyptian Cat has quite a tale to tell. This 14-inch-tall bronze feline was acquired in 1938 at what many citizens and politicians thought was an outrageous price. Sure, editorials and letters came flooding in and there were protests at City Hall, but she brought in record crowds and even a Hollywood invitation. Our gallery talks and the Webster University Film Series are part of the tale, too. 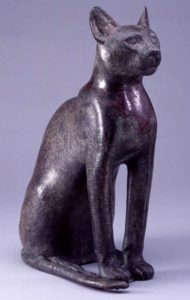 Cat; Egytpian, Late Period (664-332 BC). It was the best of times (exciting new acquisition), it was the worst of times (the Depression). Both wisdom and folly were in ample supply when the Museum purchased Cat, an exquisite Egyptian artifact created during the 26th Dynasty of Egypt (664–525 BC). Sculpted in bronze and originally intended to contain a cat mummy, this 14-inch-tall feline was purchased from a private collector in 1938 and would become a popular work in our permanent collection. But we were in the throes of the Great Depression. So why would then-curator Thomas T. Hoopes pay $14,400 for what one newspaper called a “costly bric-a-brac”? (Perspective: gas was 10 cents a gallon, bread was nine cents, and you could get a new house for less than a third of what Cat cost!) Other headlines included “It Isn’t the Cat’s Whiskers!” and “Black Cat Crosses the City’s Path.” Newspapers from New York to Paris weighed in. The Associated Press reported that the price tag “…stirred up the rumpus among unionists, persons on relief, women’s clubs, the city administration and the art museum.” One letter writer suggested the Saint Louis Art Museum sell the entire collection and display members of the Art Commission, charging 25 cents to see them. Another letter writer pointed out that, unlike acquisitions by the Saint Louis Zoo, at least this cat didn’t require feeding. A writer even posed as Cat to pen a letter to the editor defending herself. But it was no laughing matter when union laborers picketed City Hall in protest, and there was a bill put forth to cut Museum funding. It did not pass. On the tail end of all that is the “best” part of the tale: A whopping 51,323 cat-curious citizens visited Cat the month of her debut, the second highest attendance by month at the time. The Picture of Dorian Gray. Dir. Albert Lewin. Perf. George Sanders, Hurd Hatfield, Donna Reed, Angela Lansbury, and Peter Lawford. Metro-Goldwyn-Mayer, 1945. Film. Eventually, Cat caught the attention of Hollywood, too. Screenwriter and director Albert Lewin asked to borrow it for his 1945 film, The Picture of Dorian Gray. “I have seen the Egyptian things in the Louvre, and also in…Cairo, and I think this cat is one of the most beautiful of all,” he gushed. Museum officials decided Cat was too fragile and not ready for her close-up, but allowed Lewin to create a slightly taller replica to star in the film adaptation of Oscar Wilde’s novel. When Dorian wishes he could stay young forever, it’s the cat that dispenses the curse. The movie would win two Academy Awards and a Golden Globe. And currently on view at the Art Institute of Chicago is Ivan Albright’s painting of the horrific, cursed Gray that is featured in the film. While Cat might not have found the level of fame of, say, Grumpy Cat, she is an exemplary example of the popular votive figures created in honor of the Egyptian goddess Bastet, a deity associated with motherhood and a guardian of pregnant women. We hope when you visit her in Gallery 130 you’ll agree that the $14,400 was well spent. To learn more about ancient Egypt animals, attend our gallery talks on Thursday and Friday, June 16 and 17. This entry was posted in General and tagged blogging, Digital Media, ECCHIC, Freelance writer, ghostwriting, Kevin M. Mitchell, Press Releases, Social media, St. Louis, St. Louis Art Museum. Bookmark the permalink.